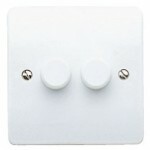 1 Gang 2 Way Push Dimmer Switch 2 x 40W – 250W. Spend another £69.97 to get FREE DELIVERY! MK Electric Logic Plus K1533WHI 1 Gang 2 Way Push Dimmer Switch 2 x 40W – 250W. Only suitable for tungsten filament lamps. NOT suitable for fluorescent lamps or low voltage lighting.